Over the past few weeks our kitchen standards have dropped and for an agency that prides ourselves on our culinary prowess we are deeply ashamed. Certain measures have been put in place in the past to keep the sides clean and the fridge in tip top order however yesterday saw a completely new initiative upheld- KCCTV. 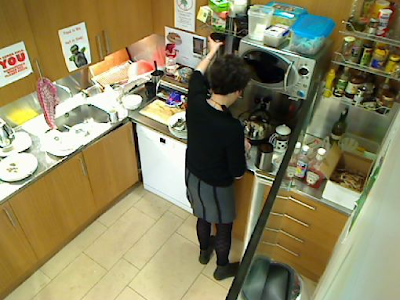 Here's Bobbie captured only minutes ago showing what you should do after you have used the sugar (put it back on the sugar shelf). If you capture any foul play on surveillance please report it to Liam and he will enforce that the culprit comes over to your house and cooks you dinner every night for the rest of your life.